Reports can show statistics and aggregated data (such as totals or averages). They can also represent data graphically (as bar charts and pie charts) to help you compare groups of tickets or assets. How many tickets did each tech close? How many tickets were opened against each asset? How many assets are checked out in each location? What is the average work time per ticket request type? How many tickets were opened against each request type? Reports can be displayed in the web interface or generated in PDF format. You can also create schedules to automatically run reports and email them to groups of recipients. From any report, you can click the ticket or asset total to display detailed information about the items included in that total. The Reports screen includes a list of predefined reports that focus on asset, billing, and ticket information. You can also create composite reports that link together a mixture of reports. Each report can include charts or tables that display the number of items in possible categories. Click Reports in the toolbar to access the Reports screen. 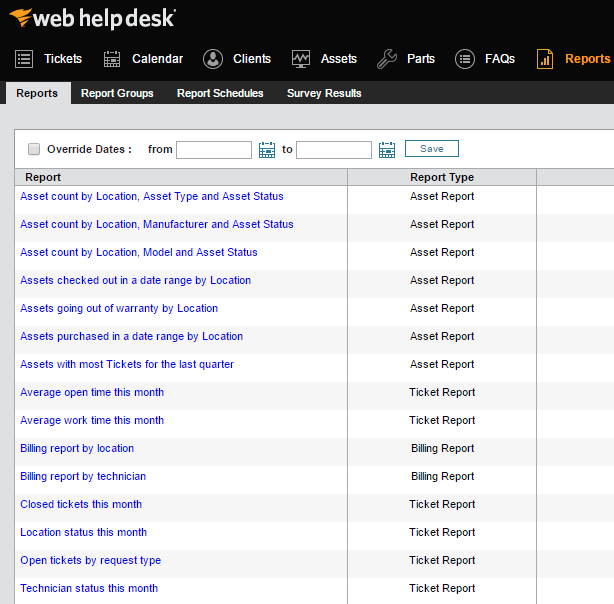 Using sample reports included with Web Help Desk, you can create asset and ticket reports to help you monitor technician performance, customer support needs by location, and incidence frequency. Using additional features incorporated into Reports, you can categorize reports into report groups, generate survey results, and schedule automated reports for distribution.